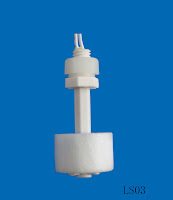 Level Sensor - Misensor Tech (Shanghai) Co.,Ltd. The purpose of a float switch is to open or close a circuit as the level of a liquid rises or falls. Most float switches are "normally closed," meaning the two wires coming from the top of the switch complete a circuit when the float is at its low point, resting on its bottom clip or stop (for example, when a tank is dry). Most float switches utilize a magnetic reed switch to open or close the circuit. The reed is encased in a glass tube, which is cemented into a plastic or stainless steel stem with epoxy. The illustration to the left demonstrates how a magnet can be used to open or close a circuit by moving it closer to or farther away from a reed switch. When the magnet comes close to the two contacts, they draw together and touch, allowing current to pass through. When the magnet is moved away, the contacts demagnetize and separate, breaking the circuit. In a float switch, the magnetic reed switch is hermetically sealed in a stem, most often made from plastic or stainless steel. The float encases a sealed magnet, which moves up and down the length of the stem as a fluid level rises and falls. As the magnet passes by the contacts in the encased reed switch, they draw together and complete a circuit between the two lead wires, as shown in the cutaway to the left. The operation shown can usually be reversed by removing the bottom clip from the switch, inverting the float and replacing the clip. When this change is made, the switch circuit will be open when the float is resting on the bottom clip and closed when the float rises. Properly used, float switches can deliver millions of on/off cycles, for years of dependable operation. Failures are normally due to overloading, frequently caused by spiking voltage. 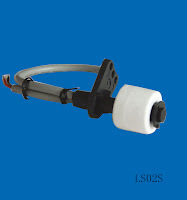 LS01, LS02, LS03 and LS04 are fluid level sensors with an integrated magnetic float and cable terminals.